“The Devil and the Muse” is the second book in the ‘Creative Series’ by Mandy Jackson-Beverly. In this dark fantasy, a group of immortals known as the Allegiance tries to stop the horrific abuse that is being forced upon targeted young girls. The Allegiance quickly learns that on the mundane level, individuals involved with this are also responsible for fraudulent acts that involve defrauding the government of money that is meant for education. On the spiritual level, the abuse of the young ladies is being brought on by an evil entity that has groups located all over the world engaging in kidnapping, horrific torture and murder. The person behind this is Kenan, and he is an enemy of the Allegiance. Kenan’s dark past is brought to light in this story, and because he is such a malevolent being, it is hard to pity him. There is one woman who can help the Allegiance stop Kenan; with her gift of being able to see visions beneath paintings, she directs the members of the group to where they need to be to stop what is happening. As the drama unfolds, the group finds themselves being tested to their limits. I loved getting caught up in “The Devil and the Muse” however, I wish I had read the first book in the series prior to starting this one. There are so many characters it is hard to keep track of everyone and I frequently referred to the character description list in the beginning of the book to help me. I know if I had started with the first book, the characters would have already been well established. The author does do an excellent job of refreshing readers on what happened in the first novel, however, I still felt like I was missing out. I enjoyed this book so much, I plan on going back and reading the first, and I look forward to the third. 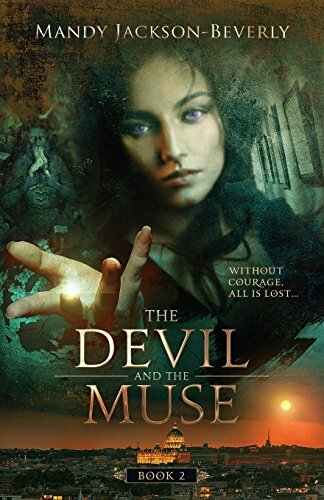 “The Devil and the Muse” is interesting because it ties in a variety of magical beings like vampires, witches, and then the Creatives, who all have special abilities. The Vatican is also involved, which added a great twist. The author manages to keep the story dark and gothic, while still including modern elements such as cell phones and social media. I love how she did this because it made the story seem more real. The visual descriptions of the art work and the incredible places are extremely well done. I felt like the author painted these places with her words. While I highly recommend reading this novel, because of the graphic nature of the abuses in the story, I will only recommend it for adults. If you like dark fantasies, you will love “The Devil and the Muse” by Mandy Jackson-Beverly!